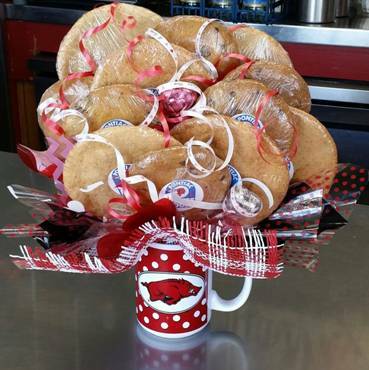 Give your guy fresh baked cookies stacked high in a premium quality coffee mug. We carefully select one of our hundreds of mugs, perfect for your man. Give us a "theme" during check-out to help us choose the right mug! He will love the heavy porcelain mug stacked full of sweetness, then remember your gift with every sip of coffee! Three sizes to fit your budget and heart!